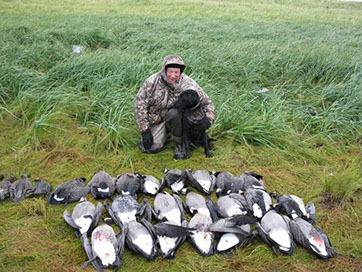 The reopening of Canada goose hunting on the Alaska Peninsula has given us the opportunity to offer a unique experience for our guests. 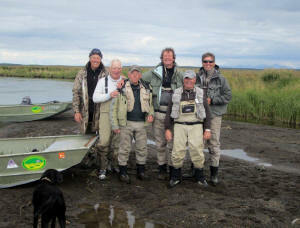 This is five days of Silver salmon fishing and bird hunting, including geese and multiple species of puddle duck. 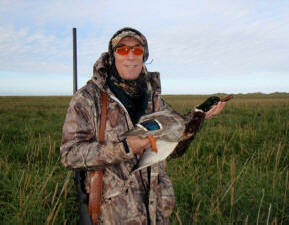 We leave the lodge at first light and fly to the tidal area where birds are flying. We land on the beaches and a few landing areas and walk to the best stake outs. My dog, Cinder is always on the lookout for incoming birds. When the birds slow down we can load back into the plane for a quick flight down the beach to the next bay south and land where my boats are stored. 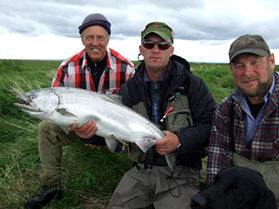 Within minutes you are fishing dime bright Silver Salmon from ten to fifteen pounds that are pound for pound some to the best fighters Alaska has to offer. Plan on catching ten to fifteen of these in three to four hours. When your arms are tired, we head back to the lodge for a hot shower, an adult beverage and the best in camp cooking. This is world class hunting of goose and duck, along with some of the world's finest fishing, for ten to fifteen pound Silver ('Coho' to some) salmon and three to six pound Arctic char. All trips are fully guided. You can tailor your own trip with any combination of things to do. If you want to know more please contact me. So if you're looking for a five star lodge with the world's most outstanding bird hunting and salmon fishing then give us a call. 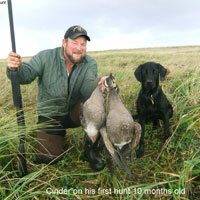 We will gladly help you in any manner to achieve your Alaskan blast and cast hunt become a reality. We also have private, personal rooms for our guests upon request or if you're looking for a romantic retreat we can do that too, just give us a call.